Armstrong Magnetics recently finished the final development stage of Auto ON/OFF lifting magnets that have powerful magnetic strength yet are small in size. The dimension of its main body is 3.93” x 3.93” x 4.92” (100mm x 100mm x 125mm) and its weight is 11 lbs (5 kg) only. We tested its breakaway force to be 1,378 lbs (626 kg) on a 3” thick plate. With 3:1 safety factor. While being compliant to ASME B30.20., this device can work as a lifting magnet with a maximum rated lifting capacity of 440 lbs (200 kg). At AUTO mode, operators need to use a hoist to move the magnet down to a load and it can automatically attract the load. After the magnet and the attracted load are moved to a destination and placed on floor, the magnet releases the load automatically. This Auto mode can be very useful and practical to transport steel plates or objects in places which limit operator access. A Manual mode, operators only need to push the button of MAG/DEMAG at its front panel while the magnet stays on the floor. For safety reason, the magnet cannot be operated to be magnetized or demagnetized while the magnet and its loads are in the midst of air. At its front panel, there is a display of battery level to remind its operator to recharge its battery. However, the magnet can stop working when the battery gets too low and its operator has to eventually charge the battery . The bumper around the magnet is to prevent its body from direct collision. 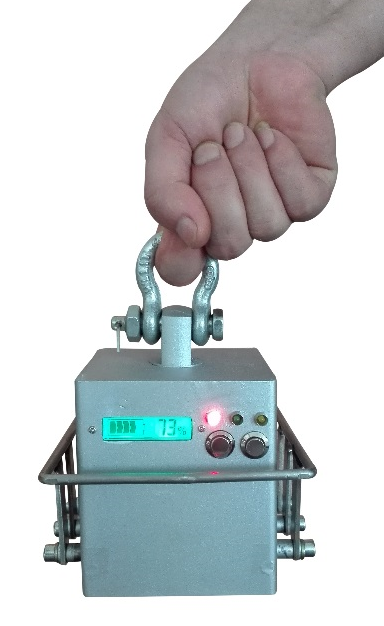 In brief, this automatic ON/OFF lifting magnet is powerful, small in size and weight, efficient, and can work remotely in places you cannot reach or go.